Between 1920 and 1929, Buster Keaton created a peerless run of feature films that established him as “arguably the greatest actor-director in the history of the movies”. Collected here are three key films from that era; Sherlock Jr. (1924), The General (1926) and Steamboat Bill, Jr (1928). I suppose it goes without saying that this isn't the sort of release you'll pick up on a whim. 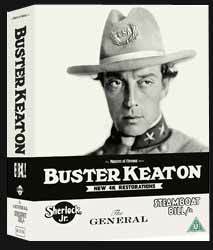 This is a lovingly restored collection for serious fans of Buster Keaton's work. With that in mind, it's pointless dissecting the movies other than to say Steamboat Bill, Jr. is probably the least enjoyable of the collection. Oddly enough, it's also the film which has the least amount of extras. Sherlock Jr is probably the most entertaining (as well as surprisingly short, while The General is the most engaging - there's real suspense mixed in with the comedy. This collection also enters, briefly into the world of sci-fi with Sherlock Jr. seeing Keaton fall asleep in the projection booth of the cinema, leave his body and then walk into the world of the projected film. Extras include an audio commentary with film historian David Kalat; Buster Keaton: The Genius Crushed by Hollywood (56 min, 01 sec which offers us background on the rise and fall of Keaton's Hollywood career); Filming Locations Featurette (9 min, 52 sec look at what the movie's locations look like today); Movie Magic & Mysteries Featurette (22 min, 32 sec which explores the history of the film and why it's so popular today when it wasn't at the time. It also looks at whether William Goodrich (Roscoe Arbuckle) directed any, all or none of the movie). Extras include Interview with Peter Kramer (40 min, 04 sec film historian perspective); Filming locations Featurette (4 min, 29 sec look at what the locations look like today); Video Tour of The General (18 min - Harper Harris (General Manager and Museum Historian of the Southern Museum of Civil War and Locomotive History in Kennesaw, Georgia) is our guide as he explains the history of the real The General train. The movie stuck closely to the real story. Buster wanted to use the real The General, but as the film was a comedy the train's owners decided against allowing him to use it); Home Movie Footage (1 min on the set); Orson Welles Introduction (12 min 21 sec intro presumably from when the film was shown on TV); and Gloria Swanson Introduction (2 min, 13 sec). For extras we get Buster Keaton on Wagon Train (58 min, 55 sec audio conversation that is a little rambling and not the best quality); Making of Steamboat Bill, Jr. - A Visual Essay (12 min, 14 sec featurette that looks at numerous aspects including why two takes/cameras where used for every single shot of the movie. The result was two prints - one for the domestic market and one for overseas. This was also Keaton's last film before he joined MGM. We also get an interesting 58 page booklet which includes a lot of photos of Keaton and his productions as well as some notes on the restoration. My one complaint is that the price is a little high and the movies would easily have squeezed onto a single Blu-ray. But then this release has a very narrow audience and the restoration wouldn't have been cheap. Also, if you're a fan of Keaton I suppose you'd want each movie on its own disc. One for serious film fans only, who will happily spend the money to get as fine a print of these classic films as currently exists... but then this was never going to appeal to anyone else.